At the northern end of Aberystwyth promenade, Constitution Hill rises dramatically from the sea, providing spectacular and uninterrupted views of the town, Cardigan Bay, and on a clear day 26 mountain peaks spanning much of the length of Wales. The most relaxing way to enjoy this majestic panorama is to travel by train on the longest funicular electric cliff railway in Britain, which has been transporting visitors to the summit since opening in 1896. The recently refurbished summit train station has just been completed, providing much better protection from the elements and updating the structure to ensure a better visitor experience. Once at the summit visitors can experience the views afforded by the one of the world’s largest camera obscuras, which offers a bird’s eye view of 1000 square miles of land and seascape. Aside from these two technological masterpieces there are fascinating historical displays, a kids play area, a well-stocked gift shop, and a cafe selling delicious home-made snacks. With such a combination of attractions, Constitution Hill offers a great day out for all. To find out more about the Cliff Railway or any of our other attractions, please feel free to call us on 01970 617642 and we will endeavour to answer any questions you may have. The Aberystwyth Cliff Railway opened in 1896 and operated on a water balance system until electrification in 1921. The unique design of the undulating track and tilted carriages is the work of George Croydon Marks, a man who played a key role in several projects during the golden age of funicular construction, and later made his name in politics as Lord Marks the liberal peer. The carriages are hauled to the summit at a stately 4 miles per hour, and are powered by a powerful motor and high-tensile steel cables supported by a sophisticated electronic safety system. In the mid-section of the journey the railway is in a deep cutting, where 12,000 tons of rock was excavated to allow the winding footpath to cross overhead on a series of bridges. Constitution Hill was the Victorian predecessor of our modern-day theme parks and is still amongst the most popular attractions in the area. 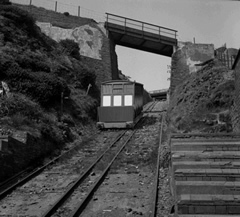 The visitors to the Victorian 'Luna Park' accessed the hilltop recreation area via the cliff railway and a century later it is still possible to retrace the steps of our ancestors on this funicular steeped in history. To find out more about the Aberystwyth Cliff Railway come and visit us, we're open throughout the year. There’s no need to book in advance, just pop up to the ticket office, and hop onboard. With trains running every few minutes, you can let the train take you to one of the best views in Wales. If you have any questions, please call us on 01970 617642, we look forward to hearing from you.